Missions are a vital part of ministry at Gainesville First, so the Missions Market folks wanted to share what your generosity has provided during the last 3 years and also cast our vision for the future. Thanks in huge part to you, the last three Missions Markets have benefited Orphanage Emmanuel, For His Kingdom (Reed & Kim Skinner), The Village of Eden, Honduras North Shore/Utila Ministry (Rev. Ferris Hardin), Journey of Trust (Mike & Karen Madsen), Serbia and Romania (Dave & Jen Cox). Over $67,000 has been distributed to the seven mission areas listed above through the sale of merchandise, culinary dishes, gift cards and donations. From that amount gift card sales of $20,225 has gone directly to needs specified by each ministry. The Gainesville First UMC membership has had opportunities to hear directly from the missions and the missionaries we serve, better educating us and connecting our congregation to their work and needs. Gainesville First members have participated in mission trips to Honduras and Uganda, finding themselves ministered to in more ways than they have ministered. By participating in Missions Market, we have all received an intangible benefit of giving hope to our sisters and brothers across the globe, living the Great Commission and uniting our membership around a shared vision of service. What will Missions Market 2017 look like? Mark your calendar for November 12, 8am - 1pm! 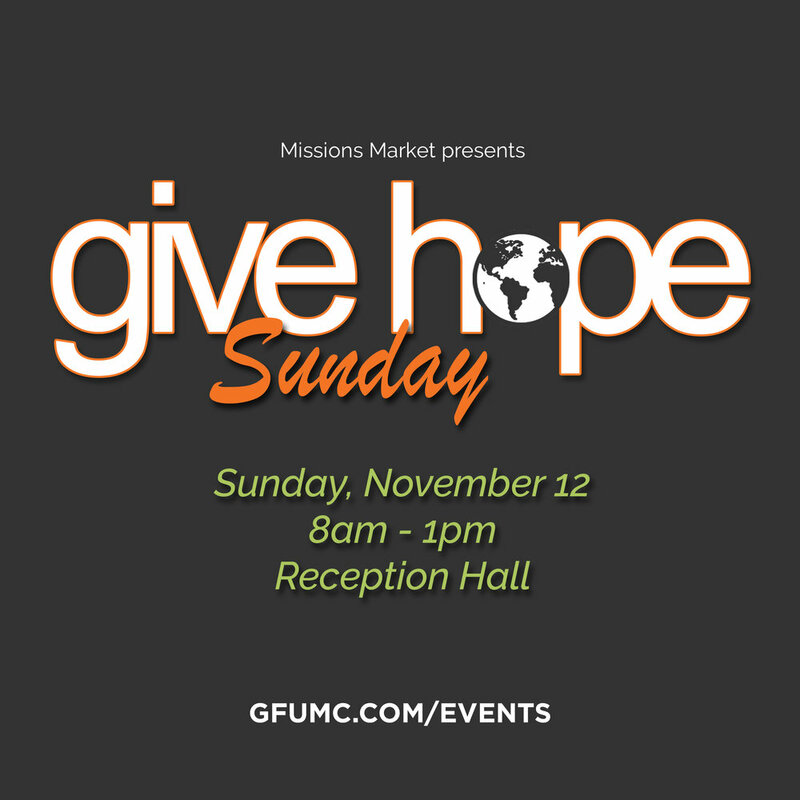 This will be “Give Hope Sunday.” You will not want to miss the light breakfast offered to our shoppers. This year’s focus will be delicious culinary treats, just in time for Thanksgiving entertaining; “Give Hope” Gift Cards; and a scaled back offering of merchandise. Still available will be our personal favorites - the Chrismon Christmas ornaments, the silver GFUMC cross charms, Debra Hewitt art, and some interesting new items. We want to thank you for your gifts of hope in the past and ask you to continue your generous giving. What a blessed body of faith is GFUMC! We are so fortunate to have HOPE. Let’s join together to give HOPE.